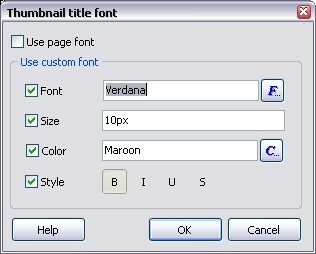 This window can help you to choose all font parameters for the text element, like font name, size, style and color. When the pages are generated these parameters are used in the inline CSS definition of the <span style="...">...</span> tag which surrounds the text element. But if you check the Use page font box, then the <span style="...">...</span> tag is not added to the text element and it will use the font that is set for the entire page, the default font. If you want to override the default font size then check the Size box and enter the desired font size in the corresponding edit field. If you enter only digits in this field, then Extreme Thumbnail Generator will automatically add px to it when the page is generated. Below is the list of all possible measurement units for the font. em 1em is equal to the current font size. 2em means 2 times the size of the current font. E.g., if an element is displayed with a font of 12 pt, then '2em' is 24 pt. You can use any of standard color names in this field: aqua, black, blue, fuchsia, gray, green, lime, maroon, navy, olive, purple, red, silver, teal, white, and yellow. Also colors can be defined as a hexadecimal notation for the combination of Red, Green, and Blue color values (RGB). The lowest value that can be given to one light source is 0 (hex #00) and the highest value is 255 (hex #FF). The table below shows the result of combining Red, Green, and Blue light sources. Font style is defined as a combination of the following values: bold B, italic I, underline U and strike-out S. You can use a combination of these values, for example B and I. Simply click the corresponding buttons.